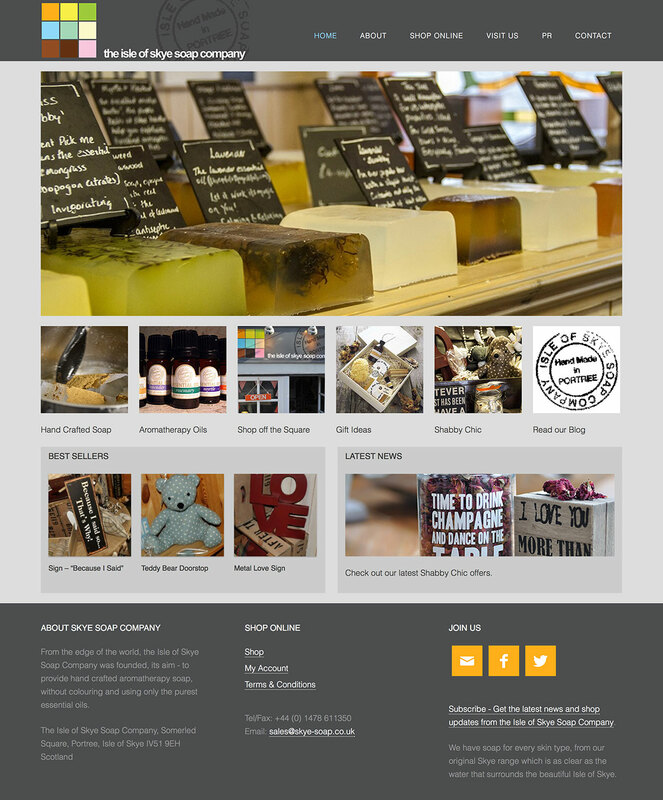 We were approached by The Isle of Skye Soap Company to design and develop a new e-commerce website to replace an existing site that had been in operation for many years. Founder and chief soap maker, Fiona Meiklejohn first launched her business as an online business, expanded into a bricks and mortar shop, and now sells through a wide range of retail shops across the UK. The project involved taking an existing logo to create a modern design and flexible website layout that would allow access through mobile devices (mobile responsive). The solution was built on the WordPress content management system using WooCommerce e-commerce plugin and email marketing integration. We were also involved in taking photographs – particularly of the process that helps tell the Skye Soaps story. The site was launched in time for pre-Christmas orders and we were delighted to hear that January web sales had shown a 130% growth – truly outstanding! Fiona, commenting on the project with us said “we found the whole process easy and the team very helpful”. The Isle of Skye Soap Company is a small family run business and has been trading on the Isle of Skye, Scotland since 2000 making hand crafted aromatherapy soap, without colouring and using only the purest essential oils.